Surrounded by the Mediterranean, the Adriatic and several smaller seas, Italy has a huge diversity of beaches that will satisfy even the most finicky of beach goers. From the crowded yet fashionable beaches where people flock to spot celebrities to tiny coves surrounded by steep cliffs that can only be reached by boat, Italy’s beaches are arguably some of the most beautiful in the world. 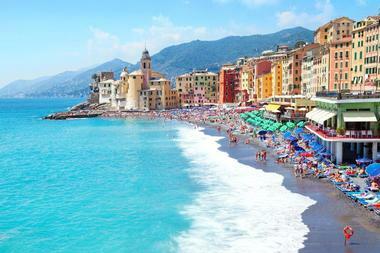 Here are the best beaches in Italy. 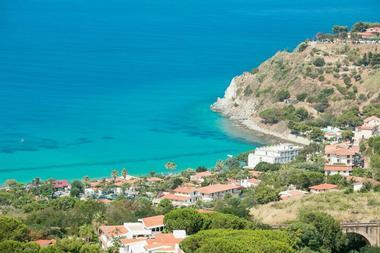 Acquafredda is a small village near Maratea and has some of the most beautiful beaches in the area. One of the best ways to see them and enjoy Maratea’s scenery is to take a drive along the coast, high up on the mountain road surrounded by dense pine forests and with some of the most spectacular views in the world. Calla di Mezzanotte, or Midnight Cove beach, is a small sandy beach at the foot of the Mezzanotte Channel. Surrounded by high cliffs and a number of caves, it is both romantic and secluded and is accessible only by boat. The Anginarra beach is one of the largest in the Maratea area and consists of about 300 meters of sand wedged between high cliffs, leading to a large cave on one side of the beach. Crivi beach is a small stretch of sand about 30 meters long and backed by a 400-meter high limestone cliff. It can only be reached by boat. The charming little coastal village of Camogli in Liguria in northwestern Italy has a large pebbly beach that stretches along the length of the coast. It has all the Mediterranean beauty of the French Riviera but is far less crowded. The beach is divided into private sections that belong to resorts and beach clubs and other sections that are open to everyone. Pebbles range from coarse gravel to small, smooth and almost sand-like pebbles. There are swimming lessons on offer for children as well as rowboat and canoe rental, a beachside drink service, and diving courses. The beach is very picturesque with the ancient and magnificent Basilica of Santa Maria Assunta standing guard on a promontory above the harbor against the backdrop of the mountains. Campo all’Aia Beach is the longest beach on Elba Island . It is a fairly wide stretch of fine sand, sheltered from the wind and fairly shallow, making it perfect for children and those learning to swim. Access to most of the beach is free, but there are several restaurants on the left side, and the La Guardiola Sailing Club with its mooring wharf is on the far right side. The club organizes boating trips but also has a nice bar and rents out canoes, umbrellas and lounge chairs. Just off the beach there is the wreck of an ancient Roman ship from 190 A.D. that can be fun to explore as it lies only three meters below the surface. 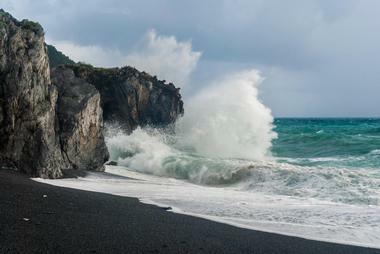 Riserva Naturale dello Zingaro lies at the far end of the western coast of Sicily. As Sicily’s first nature reserve, it is a magnificent wild area with seven kilometers of spectacular coastline full of small coves with lovely beaches. The entire area has been protected from development and is still the way it was centuries ago, filled with hundreds of native plants and animals thriving in the rugged terrain backed by steep mountain slopes. 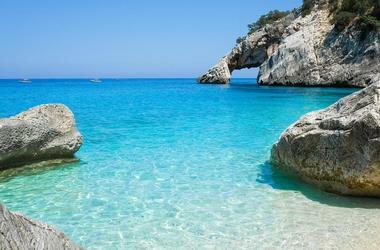 Sardinia’s beaches are among the most beautiful in the world, ranging from fine sand to large flat rock slabs. Cala Fuili beach is a crescent-shaped and small - only 230 meters - secluded beach in a lovely cove protected by large, almost vertical cliffs covered with dense vegetation. 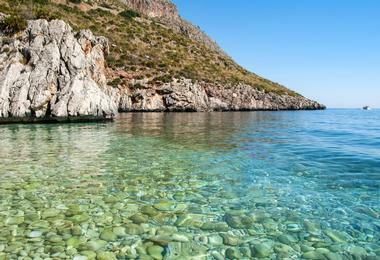 Small smooth pebbles are mixed with rocks, giving the azure blue water fantastic visibility. This beach is a heaven for snorkelers and divers. Rocks around the beach are popular for rock climbing. 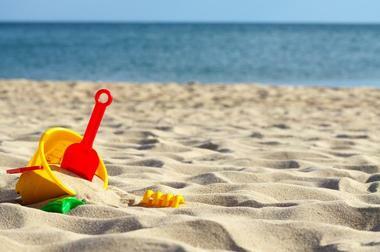 There are no facilities of any kind, so bring your own beach chair, snacks and drinks. The village of Sas Linnas Siccas is nearby. The ancient and picturesque town of Praiano is perched high up on the cliffs that plunge down towards the clear Mediterranean waters. Its beaches are small, nestled in tiny coves, and often crowded. One of the most beautiful is Gavitella, which is only 30 meters long and has two concrete piers that add more space for sun worshippers. The views of Positano and Capri Island in the distance are spectacular. There is a nice restaurant on the beach offering meals and refreshments. To reach the beach from the Praiano main square, go down the over 400 steep steps that are cut in the rock, or take the shuttle boat, which is free for restaurant guests. 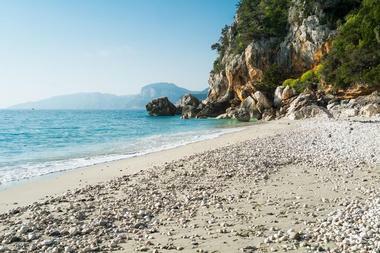 Cala Goloritze is a true Sardinian pearl. It is a stunning and tiny beach, only about 200 meters, hidden at the base of a deep ravine just south of Biriola beach and about nine kilometers from the town of Baunei. The only way to reach it is to take an hour-long hike, but it is worth it. The white pebbles lead you down to the clear blue water that is transparent all the way to the bottom, teeming with fish and other sea life. 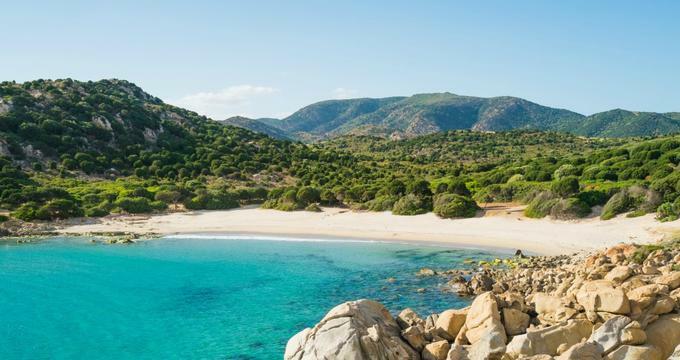 Don’t forget to bring your snorkel - Goloritze beach has been declared by UNESCO as the best snorkeling beach in Sardinia. Capo Vaticano is a spectacular white granite rock that drops dramatically 124 meters down to the azure sea below. The town perched on the rock is ancient and surrounded by many curious legends that date back to Roman times. At the bottom of the rock is a series of small bays with lovely white sandy beaches lined with charming restaurants and cafes. The most popular, and indeed the most beautiful of these, is Grotticelle Beach, which has fantastic snorkeling in the crystal clear waters that are full of marine life. The whole area is very popular with tourists and it can get crowded, but the views are so spectacular that sharing the beach with other admirers is no great hardship. 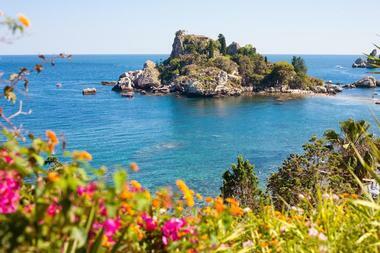 Isola Bella is a beautiful little island near Taormina, Sicily, called The Pearl of the Ionian Sea. It sits in the middle of a small bay and is famous for its wonderful exotic plants that were introduced by the previous owner and which thrive in the mild Mediterranean climate. It is now a nature reserve and its lovely smooth-pebbled beach is very popular among tourists because of the clear blue waters and the fantastic views of the mainland and the Ionian Sea. The island and the beach are protected by the bay and the water is always warm and calm. Access to the island is by a cable car from Taormina to Mazzaro or by walking across a small path that connects the island to the larger beach on the mainland. 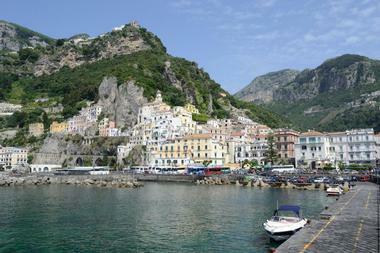 Marina del Cantone is a small, secluded coastal village at the end of the Sorrento Peninsula. Only an hour’s bus ride from Sorrento, it is the place where locals and those who can’t stand crowds come to enjoy a peaceful day on the beach. 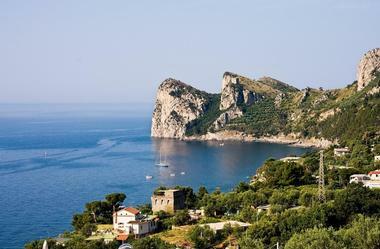 A lovely pebble beach stretches just below the village of Nerano, perched on the cliff above. The beach is lined with modest local trattorias and cafes where one can have an excellent meal and join the locals in peacefully enjoying the view and the warm sun. Lounge chairs and umbrellas can be rented at one of the local shops and the clear water invites for a pleasant, refreshing swim or snorkel. Marina Grande Beach is the main beach of Positano, where celebrities come to have their photos taken. It is the kind of beach people imagine a beach in Italy should look like. It is one of the most famous beaches on the Amalfi coast and at 300 meters long, with smooth white pebbles, packed with lounge chairs and umbrellas and beautiful bodies soaking up the sun, it is the center of the town’s social life. On one side is clear blue sea, perfect for a cool dip or a pleasant swim, and on the other is a string of bars, cafes, restaurants, boutiques and a famous Music on the Rocks disco. 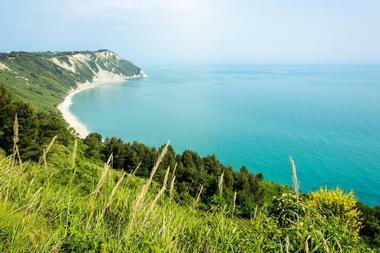 Located in the spectacularly beautiful Bay of Portonovo and surrounded by steep cliffs dropping dramatically into the blue Adriatic, Mezzavalle is the first beach on the journey north from Ancona. The long and narrow smooth-pebbled beach has occasional stretches of sand. It is wild and secluded and can be reached only on foot or by boat. A narrow steep trail leads down to the sea from the car park at Portonovo square. There is a small bar and bathrooms with showers, but bring your own lounge chairs and umbrella. The water is clear and calm, perfect for a leisurely swim to cool off after the hike down the cliff. Otranto is a beautiful old town with a long and rich history, and has amazing stone houses, narrow cobblestone streets, a lively port, and an endless blue sea edged by a small yet charming beach. Otranto used to be an important Greek, and later Roman, port and has now been taken over by tourists who roam the narrow streets, relax in the quaint cafes and restaurants, watch the local children jumping from the steep rocks, and enjoy the sun and the sea on the small city beach that tends to get very crowded during the high season. If you are looking for a larger and more secluded beach, venture outside the city and try the beautiful sandy beaches like Baia dei Turchi. On a clear day, you can see all the way across the Adriatic to Albania – you are in the easternmost part of Italy. 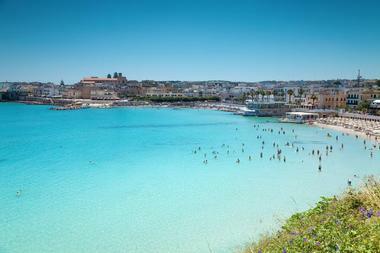 Far from the coast of Sicily, almost closer to Africa than to Italy, is a beautiful small island called Lampedusa. Rich in history and culture, it has been conquered at various times by the Greeks, Romans and Arabs. 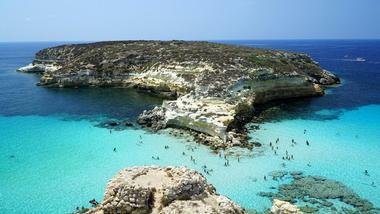 Just off Lampedusa is an even smaller, and even more beautiful, island called Rabbit Island. Rugged and scenic, it is covered with sparse Mediterranean vegetation and at some point in time had lots of rabbit, hence the name. Today it hosts a number of endangered loggerhead turtles and has been declared a marine reserve in order to protect their nesting sites. The beach on the island is one of the most beautiful in the world: small, fine white sand, washed by soft waves and surrounded by clear water that changes from pale green to deep azure as it gets deeper. The sea is full of marine life and great for snorkeling or diving. Reaching Rabbit Island is quite an adventure, but it is well worth it. 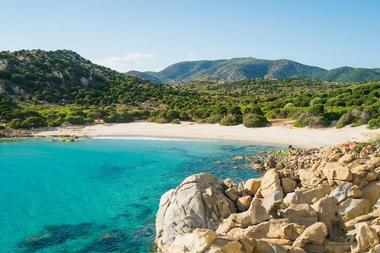 Tuerredda beach near Domus de Maria in northern Sardinia is one of the most beautiful of Sardinia’s beaches. 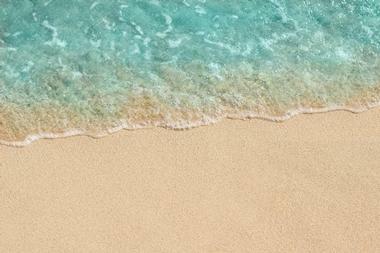 About 400 meters long, this V-shaped sandy beach is sheltered from the wind and great for swimming and snorkeling. There is a small island, Isola di Tuerredda, about 200 meters from the beach that is easily reachable by kayak or even by a strong swimmer. The beach is very popular so it can get crowded. Several establishments rent out lounge chairs and umbrellas. There is a nice restaurant where you can sit, relax and sip your prosecco while watching the beautiful view and enjoying the sun and the magnificent blue sea.